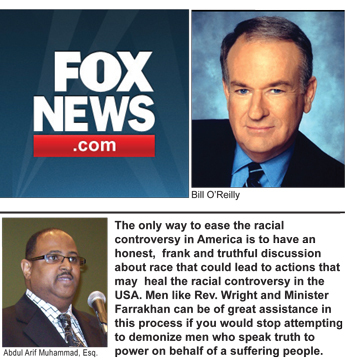 Mr. O’Reilly on the Talking Points segment of your show posted on foxnews.com, on April 28, 2014, you comment on “Another racial controversy in the USA.” In your commentary you falsely compare the recent racist remarks of Nevada Rancher Cliven Bundy and Los Angeles Clippers owner Donald T. Sterling to “so-called” bigoted remarks of the Rev. Jeremiah Wright and the Honorable Minister Louis Farrakhan. This was not only an erroneous and insulting comparison, but it was also wicked and perverse. You call your show “the no spin zone,” but in this instance, you are clearly spinning a web of lies and deceit, and misinforming your millions of viewers of truth about why there is a racial controversy in America. Unfortunately, your commentary further highlights why we have a racial controversy in America. The definition of bigoted is “utterly intolerant of any creed, belief, or opinion that differs from one’s own.” The remarks of Mr. Bundy and Mr. Sterling clearly fit that definition. The expressions of Rev. Wright and Minister Farrakhan do not, and here’s why. The racist statements of Mr. Bundy and Mr. Sterling, and the expressions of the Rev. Wright and Minister Farrakhan emerge from two distinct and separate historical contexts and foundations. For Mr. Bundy and Mr. Sterling, their statements emerge from a White supremacist and slave master mentality that is a vestige of a three century chattel slavery condition, forcibly imposed upon Black people by Mr. Bundy’s and Mr. Sterling’s forefathers, and another century and a half of Jim Crow Segregation, discrimination, inequality and injustice, which continues unabated, and which Mr. Bundy and Mr. Sterling apparently desire to see continued. The remarks and expressions of Rev. Wright and Minister Farrakhan are made in response to the evil and wicked consequences that have resulted from slavery, Jim Crow Segregation, discrimination, inequality and injustice. Moreover, their expressions and actions are to correct a self-destructive condition, resulting from a Black inferiority state of mind that was created during our enslavement in America and the colonization by Europeans of the darker peoples of the earth. In other words, Rev. Wright and Minister Farrakhan are trying to clean up the horrendous condition of life among Black people produced by Whites. They are attempting to do a good work in service to their people and humanity, while Mr. Bundy and Mr. Sterling seek to continue an unrighteous and unjust system. Your comments, along with Mr. Bundy’s and Mr. Sterling’s, reflect an irreconcilable perception of the reason for the existence of a racial controversy in America, between White and Black. It quite simply is the refusal to stop the evil and unjust treatment of the Black man and woman in America that produces a chronic and systemic racial controversy. Their remarks reflect a White superiority thinking that permeates every institution in American Society. The racist statements of Mr. Bundy and Mr. Sterling are not simply the racist remarks of two individual men as you try to argue. As Dr. W.E.B. Dubois stated in his book, The Souls of Black Folk, “The problem of the 20th Century is the problem of the color line.” It remains true in this 21st Century. It is remarks like those in your commentary, and remarks by Mr. Rush Limbaugh, the Tea Party Conservatives of the Republican Party, the Neo-Cons and others, that sustain and maintain a racial controversy in America. The only way to ease the racial controversy in America is to have an honest, frank and truthful discussion about race that could lead to actions that may heal the racial controversy in the USA. Men like Rev. Wright and Minister Farrakhan can be of great assistance in this process if you would stop attempting to demonize men who speak truth to power on behalf of a suffering people.